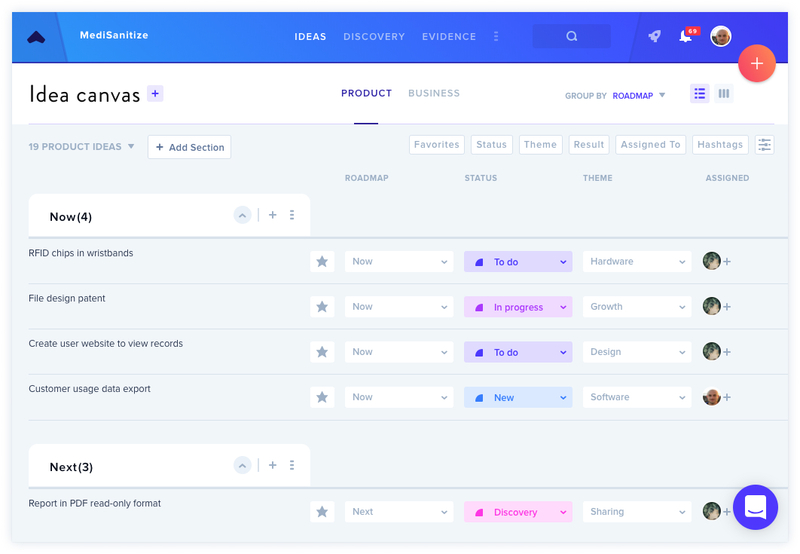 The Product Canvas allows you to capture feature ideas, user stories, and other product ideas directly in GLIDR. Your Canvas defaults to List View, although you can also switch to Kanban format if you prefer. Click the dropdown icons to update the Roadmap, Status, or Theme for one or more cards. Click the icons for Ideas, Discovery, and Evidence to connect this card to other pieces of data in-line. Add or edit assignees, and more! You can connect your Ideas and Evidence from within List View, making it easy to quickly make changes. Drag and drop your Ideas between sections, or within the section, to prioritize them. You can also drag and drop whole sections. There are times when you only want to see certain Ideas, such as those currently in progress, or those relating to a particular theme. You can filter by these criteria, as well as others, such as assignee or hashtag, by clicking on the filter buttons above your Ideas. Find out more about Ideas in GLIDR here.